So this week, this is kind of a cop-out recipe since I’ve made it before a few times over the past few years. Anyways, it’s usually a hit because it really hits all the keynotes a salad should have: salty, crunchy, savoury, and peppery. I was going to make something this weekend but… when I looked at this week’s flyer from IGA, Safeway, T&T, and HMart, nothing popped into my head. 3. 3/4th pink lady apple cut (matchstick) tossed with juice of half a lemon. The lemon will prevent the apple from browning. 4. About 6 cups of spinach. Toss all of these ingredients together. Do not make this too much in advanced because the spinach will welt when it’s not kept cold – I only put saran wrap to cover the bowl because I’m bringing this to a picnic next door (burnaby national park is what I think it’s called?). For the dressing, mix together 2 finely chopped shallots, 3 table spoons of dijon mustard (here I used Dijonaise by Maille – I only eat mustards by the Maille brand), 1 cup of extra virgin olive oil, 1/3rd cup of red wine vinegar, juice of half a lemon, a pinch of salt, and fresh cracked pepper. Put into an air-tight container and shake to combine. 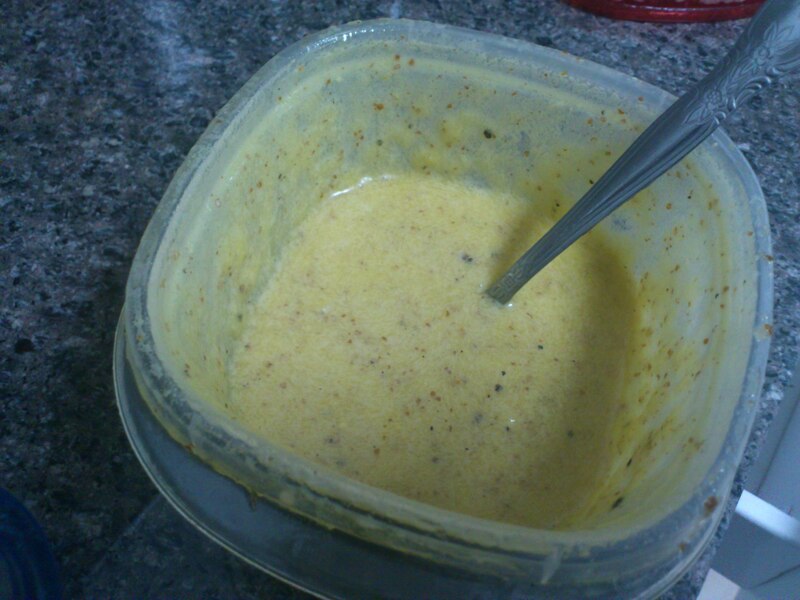 Of course, you can adjust the recipe to suit your taste.This amount of dressing is enough for two salads. Lightly toss with the apple/spinach/pancetta/red onion mixture to coat. Remember to only add enough to coat everything evenly. The dressing really hits all the good points of a dressing/vinegrette because you taste the vinegar, oil, with the added notes of the lemon juice, mustard, and shallots. 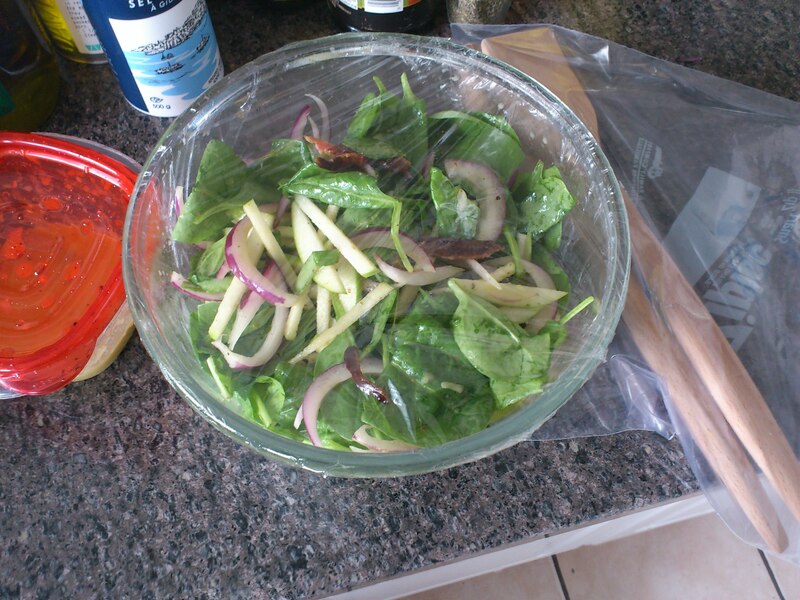 The vinegrette helps offset the bitterness of the spinach, while the apple, pancetta, and red onions work perfectly into this salad adding the sweetness and saltiness. I don’t remember where I got this recipe – but it’s somewhere on foodtv.com/ca. 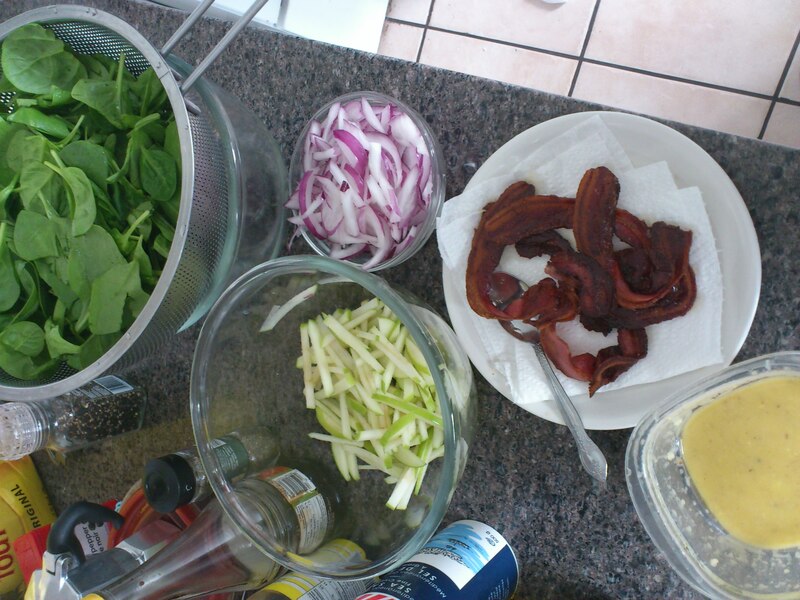 This entry was posted in Food and tagged apple, pancetta, salad, spinach. Bookmark the permalink. That looks good!!!!!!! I’mma try this, except replace the apples with some cheddar and crushed macadamia nuts. Andrew just got up and saw the dumplings and now wants them. lmao..